With the current election season in full swing, there is a lot of talk about the Founders and the Constitution. I’ve had my own fascination with this period. When I was a kid, Thomas Jefferson was my boyhood hero. I thought he was the epitome of what people could strive for, an excellent scientist who made profound contributions to the founding of our nation and to the ideals of human liberties more generally. Because of my boyhood fascination with Jefferson, I’ve made it a point to read as much as I can about that period in our history. 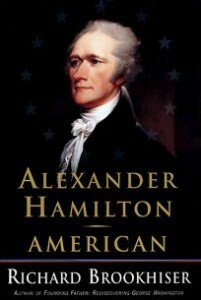 Richard Brookhiser’s Alexander Hamilton, American, focuses on one of the lesser-known figures in our founding. Of course Hamilton features on the $10 bill, but he was one of the few people adorning our money that wasn’t a president (Benjamin Franklin being the other). Hamilton owes his prominence on our money to his role as the first Secretary of the Treasury, in George Washington’s administration. Before that, however, he was a commander in Washington’s army and an ardent defender of the Constitution as it was being ratified by the various states — he was the most prolific of the three authors of The Federalist Papers. Brookhiser’s account of the life and contributions of Hamilton to our nation is both concise and well-delivered. He provides a good sense of the man, both in his personal and public lives. Hamilton was an accomplished lawyer, and this colored how he presented himself and how he argued, for example, for the Constitution. These days, we hold the Constitution almost in reverence, but back then, it was a document that was not necessarily going to be approved by the majority of the states. Hamilton did a lot in making sure it was. As Secretary of the Treasury, he was instrumental in providing the new nation a secure financial foothold. While his proposals were controversial at the time, especially opposed by the so-called Republicans, led by Thomas Jefferson and James Madison. Essentially, the debate was the same as it is today: what is the role of the federal versus state governments in the governing of the nation. Of the Founders, Hamilton had perhaps the most unique perspective. Rather than being the son of landed gentry in Virginia or other established families in the Americas, he was born in the West Indies and his parents died early in his life. He eventually made his way to what would become the United States to attend school. He was very much a self-made man, but at the same time, he recognized that his rise was often the consequence of luck, of being noticed by the right person to facilitate, for example, his move to the colonies. He believed in his skills and the need for hard work, but he also realized that he could easily have stayed as a poor man in the West Indies if not for some fortunate circumstances. Just as with the Constitution itself, we have a tendency to romanticize the Founders. We almost think of them as infallible. However, one thing that becomes immanently clear upon reading about the lives of figures such as Hamilton and Jefferson is just how human they were. We often complain about the sad state of affairs of politics in our own times, but it isn’t so obvious that they were much better back then. The leaders of the newly-minted political parties — the Federalists and the Republicans — were constantly attacking one another, revealing dirty laundry, and insulting one another in the press. They wrote letters to other important people disparaging one another. Jefferson, in some sense, was one of the worst. It seems that Hamilton never got overly personal in his attacks, attacking ideas more than specific people, but he ultimately lost his life in a duel due to, in part, his machinations behind the scenes to ensure that Aaron Burr did not win the presidency. They were very political beasts back then, as they still are today. Hamilton’s contributions to the formation of our nation cannot be understated. He established institutions that provided for the stability and ultimately prosperity of our nation. He also defended the basic ideals upon which our nation was founded with a vigor and depth that continue to inspire. Brookhiser’s biography is certainly worth a read both for the perspective on Hamilton but also the time of the Revolution and the Founding more generally.